As the holidays draw near, we all look forward to delicious food and creating memories with family and friends. It’s also a time to give back to those in need. 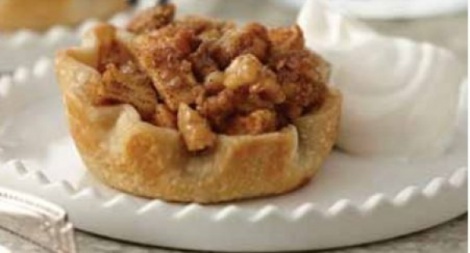 • For the Mini Apple Pies, unroll crusts on lightly floured surface. Using 3 1/2-inch round cutter, cut out 6 rounds from each crust. Re-roll scraps as necessary. Press dough rounds into muffin pan sprayed with no stick cooking spray. Set aside. • Toss apples, brown sugar, flour, vanilla and cinnamon in large bowl. Divide evenly among crusts. • For the Topping, mix brown sugar, flour, butter and cinnamon in medium bowl until crumbly. Stir in walnuts. Sprinkle evenly over apple filling. • Bake 14 to 18 minutes or until topping is golden brown and filling is bubbly. Cool completely in pan on wire rack. • Meanwhile, for the Vanilla Whipped Cream, beat cream, confectioners’ sugar and vanilla in medium bowl with electric mixer on high speed until stiff peaks form. Serve Mini Apple Pies with Vanilla Whipped Cream.